Usually I am not a big fan of any types of BBQ sauce, I only use it when making ribs and use it as a marinade, but I do have friends and family that do like to have a sauce with their grilled meat and it is a very common thing here in Germany. I have made several different recipes over the years and mostly I find them too vinegary on the taste, this one however I found was a Heston recipe and I made it and then it was so sour I had to adjust it heavily and in the end I had a bbq sauce that people were drooling over. Too bad that I never wrote down what I was putting in. Sometimes that is a typical me, cooking with a feeling and knowledge that it should taste good. Anyway, I made a second batch based on Heston’s recipe and I could seriously drink this out of the bottle it is so good, but then that is only my opinion, try it for yourselves!! Mix the dry ingredients, ginger, mustard powder and smoked paprika in a bowl with a whisk. Pour the oil in a frying pan on a medium heat and add the chopped shallot and fry it until golden and nicely caramelised. Then add the passata and cook for 5 minutes before adding the dried spice mix, vinegar, sugar, Worcestershire sauce, golden syrup and garlic. Bring to a boil then reduce to a simmer for another 5 minutes or until you have a nice sauce consistency. Using a hand blender or small blender blitz the sauce until it as smooth as possible. Season with salt and freshly ground black pepper and push it through a sieve to remove any bits of garlic and shallot and this of course makes the sauce really silky. 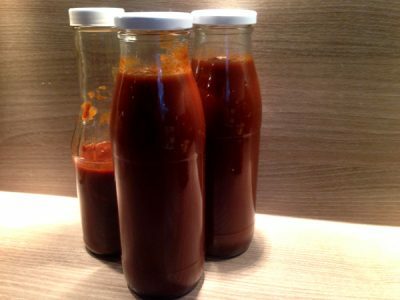 When it has cooled you can pour the barbecue sauce into a freezer bag or what I usually do is sterilize a ketchup or sauce bottle depending on size and then pour the BBQ sauce in and hey presto, you have a great BBQ sauce! This also makes a very good marinade for ribs or chicken.